Keep stirring gently until the milk comes to boil – and voila, no mess to scrub! Easy! This could have been my shortest tutorial yet – however, the milk whispering procedure as such isn’t why I started this conversation. Rather, I would like to discuss in detail why I prefer doing it this way – and why it’s crucially important for your health and wellbeing! Intrigued? Let’s talk this through, but it’s kind of a long story – so make yourself a relaxing cup of herbal tea and get comfortable, as we have a lot to discuss. It's quite easy to get milk sticking to the bottom of the saucepan when boiling it. It forms a sticky layer of burnt milk and it's difficult to clean. 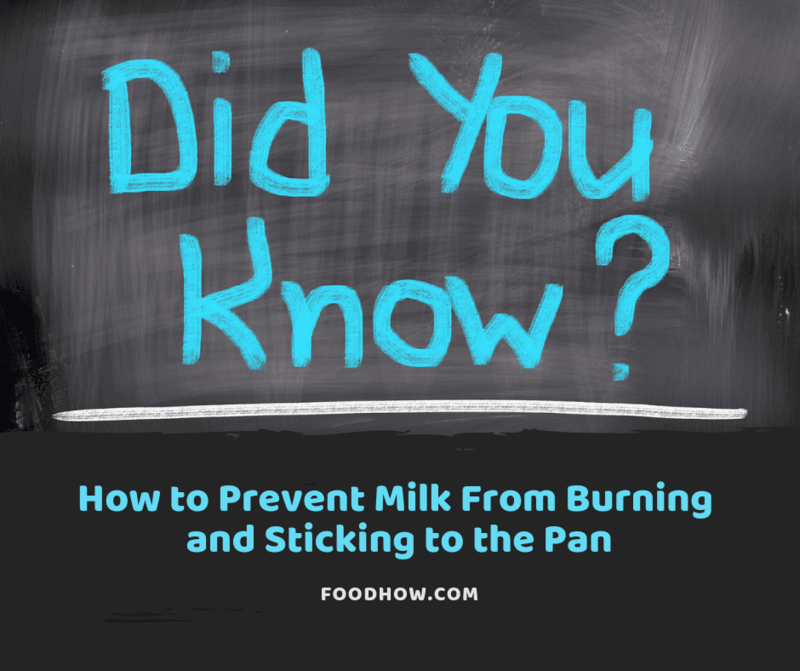 Here are some very effective and bit less effective ways to boil #milk without burning or sticking. Boil Your Milk Like An Expert With Even More Tips And Tricks! White jelly. Creamy potatoes. Custard. Babycino. …and hundreds of other dishes and snacks requiring boiled milk! As an avid cooker, it seems like not a single day goes by in my household without the need to boil a pot of milk. Between juggling other household responsibilities and entertaining toddlers, it’s easy to miss the precious second when the milk is just right – and before you know it, everything is sticky and burnt. Oh, the pain! If you search online for painless milk boiling tips, one of the major ones you’re likely to find is using non-stick cookware. Some of the options commonly listed include Teflon, aluminium, copper, and ceramic coating. The risks of heating milk on a regular base with non-stick or other toxic cookware greatly outweigh the benefits. However, I’m not the one to stop digging on the first search engine results page, so I kept reading on and discovered that all these options have something not-so-great in common: they are, in fact, bit toxic! The disadvantages of using these are so prominent that I would never recommend trading your health for a slightly easier milk boiling process, especially since there are much safer methods. Not to sound dramatic, but even the best dietary choices can produce terrible health complications if toxic cookware is used routinely! And if you are still sceptical (just as I was at the start of my quest), below you will find detailed information about the worst offenders. I personally consider this trendy guy the worst offender! For most people, the primary reason for choosing Teflon is convenience – yet, little do they know about the harm involved. This is because to make Teflon pots non-stick, they are generously coated with something called PTFE (or if you’re feeling chemically inclined today, polytetrafluoroethylene). This plastic polymer releases toxic fumed when heated, causing flu-like symptoms such as headaches, chest tightness and more. The symptoms typically appear a few hours post exposure, so it’s not that easy to connect the dots. And if you have pet birds, please eliminate Teflon since the fumes can be deadly for feathered creatures! But wait, there’s more: Teflon cookware also contains PFOA (stands for perfluorooctanoic acid), also known as C8. This chemical can stay in the body and in the environment for prolonged periods, which is scientifically linked to several types of cancer (i.e. breast, prostate and ovarian). Although the C8 content of Teflon cookware is deemed relatively low, it adds up to our total daily exposure along with other products, and it makes sense to try and limit the negative effects at least when cooking. 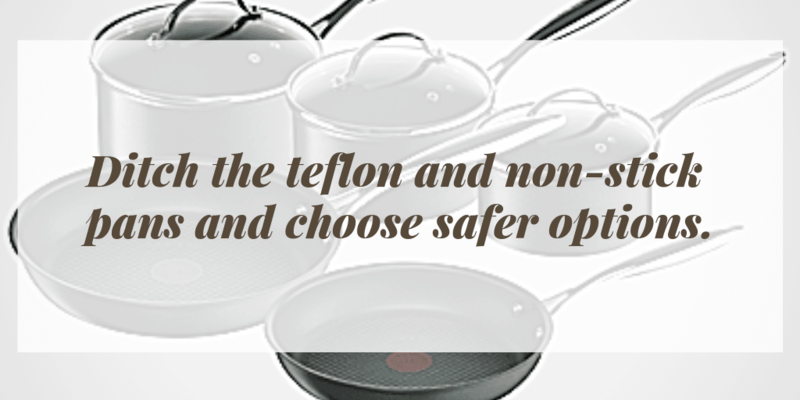 If you still insist using Teflon then to minimise the risk you should always treat it with utmost care, not heating the pan or pot excessively or leave it unattended. Make sure you are always heating the saucepan with something in it and never scratch off the Teflon and consume it for dinner. If you are only using your Teflon saucepan to warm your milk then you should be quite safe but keep on reading as I still got some different options for you below. As more and more consumers discover the dangers of Teflon, there is high interest for non-stick alternatives, such as granite coating. And it can be safe…but only if it’s completely intact, which is not the most realistic expectation for something heavily used daily. As soon as the stone-coated item starts chipping, discard it immediately and don’t let toxic substances literally slip through the cracks. See, aluminium act as a neurotoxin, damaging the brain and disrupting neural transmission! Elevated aluminium levels in the body have been linked to conditions such as Alzheimer’s and ALS, for instance. 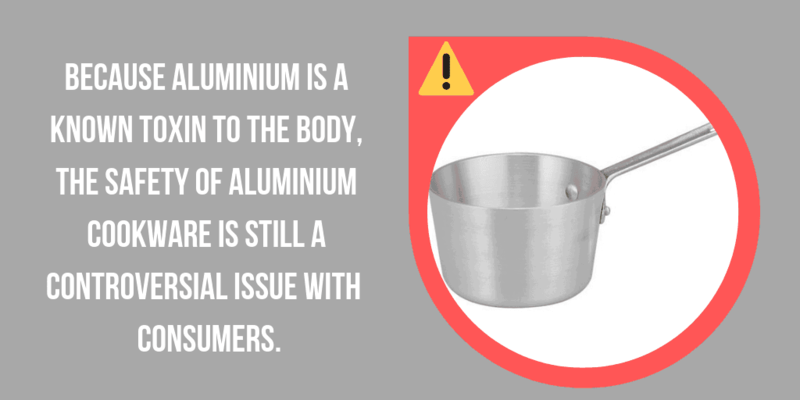 You might object and say that aluminium cookware is coated – however, just like stone coating, this protective layer is incredibly easy to damage! Besides, tiny invisible chips may end up on your plate, promoting aluminium ingestion. Certainly not ideal! Copper cookware is on trend, with its stylish looks and sturdy properties! However, I strongly advice against adding copper items to your cookware collection. 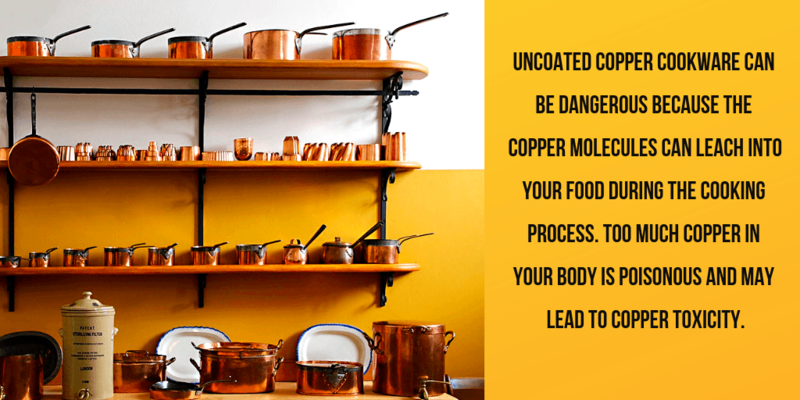 Copper cookware can cause excessive copper ingestion, sending you right to the ER with some scary symptoms! These may include vomiting, yellowy skin, dizziness and gastrointestinal discomfort, and any combination warrants prompt medical attention. It looks nice and appears safe – after all, you might have seen claims deeming ceramic 100% safe for cooking! Unfortunately, ceramic coating wears off, revealing the nasty stuff beneath. Worst of all, the soft ceramic coating is very soft, so damaging it doesn’t require any effort, just a few months of constant gentle use. The coating chips often contain lead and cadmium, and both can cause severe poisoning in extreme cases. Otherwise, you may experience consequences such as gastrointestinal discomfort, vomiting, infertility, and more. Feeling a bit overwhelmed? I was too upon just discovering the information above and doing more research to confirm these findings. Fortunately, however, there are safe alternatives to use – so onto the next section where I’ll tell you all about it! Are your pots and pans #toxic? There could be some hidden chemicals in your #cookware but don't worry, here are 3 safe alternatives you can use instead. Doesn’t contain any nasty chemicals, just iron! It may end up in your food, which in this case is a good thing, especially for those with confirmed iron deficiency. 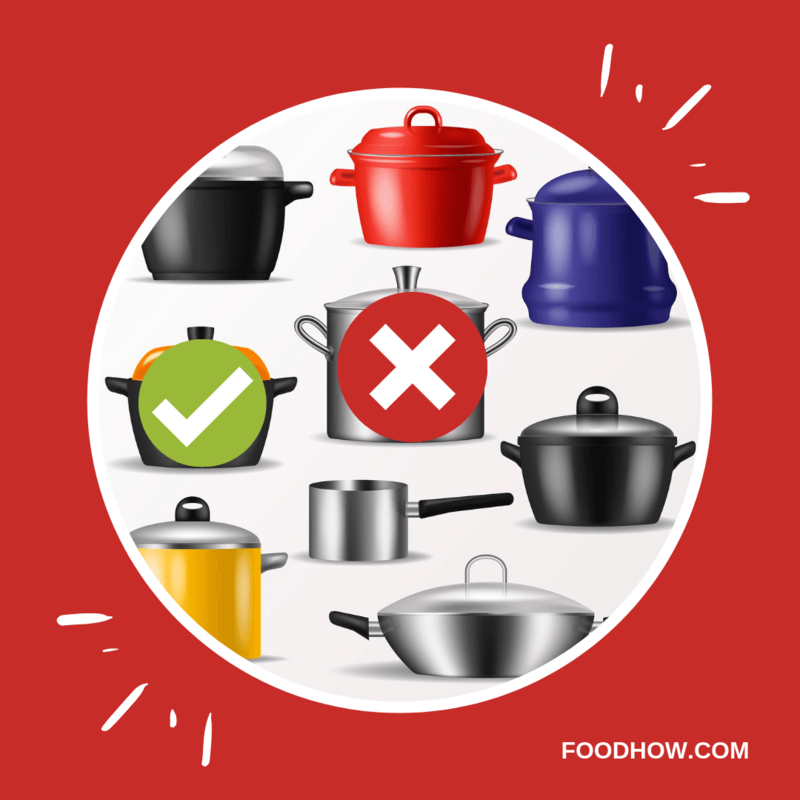 Conversely, if someone has a condition causing them to retain excess iron, pick one of the alternative non-toxic cookware options below instead. The main disadvantage is relative fragility of 100% ceramic cookware, so if you don’t want to worry about it too much, opt for other non-toxic alternatives which are plentiful. Not only non-toxic and eco-friendly, but glass cookware is also extremely durable – contrary to popular belief! Free of PFOAs or highly fluorinated chemicals, glass items are a great addition to your kitchen. Just in case, look for “oven-safe” labelling to avoid nasty surprises. Bonus tip: storing your food in glass containers is also a far superior option compared to plastic counterparts! Along with cast iron, premium food-grade stainless steel is crowned one of the best non-toxic cookware options. This sturdy material resists damage, leaching, reactivity and corrosion, making it ideal for food preparation. However, buyer beware: there are many grades of stainless steel, and not all are food safe. In addition, those sensitive to nickel should aim for 18/0 specification stainless steel (18% chromium, 0% nickel). Otherwise, small amounts of nickel may be present for additional corrosion and rust prevention. Learn more here. To maintain the non-toxic properties, stainless steel cookware must never be cleaned with abrasive materials. Otherwise, the damaged lining may leach metals, which is why any damaged stainless-steel cookware item must be discarded immediately. Now that we’ve identified the best non-toxic cookware, let’s get right back to milk boiling! This most popular way of boiling milk is coating cookware with cold water. Although some of the other method below I find more effective when it comes to boiling milk without sticking, this one seems to be most widely used. Rinse inside of it with cold water and leave 1 tbsp of cold water in the pot, as that would act as an anti-burning protective layer. Pour milk into the saucepan and start heating it on low heat, stirring frequently. Keep stirring until the milk starts to boil. There is a quick illustration of a very similar milk boiling method in this video below. Try misting the pan with vegetable oil before boiling the milk. The science behind this method is quite fascinating: by making milk proteins less likely to adhere, vegetable oil prevents milk coagulation, the root cause of sticking nightmares. Another tip is using Boil Alert, also known as Pot Watcher. This little gadget starts rattling gently when the water comes to boil, as well as controls air bubble release to prevent boiling over. 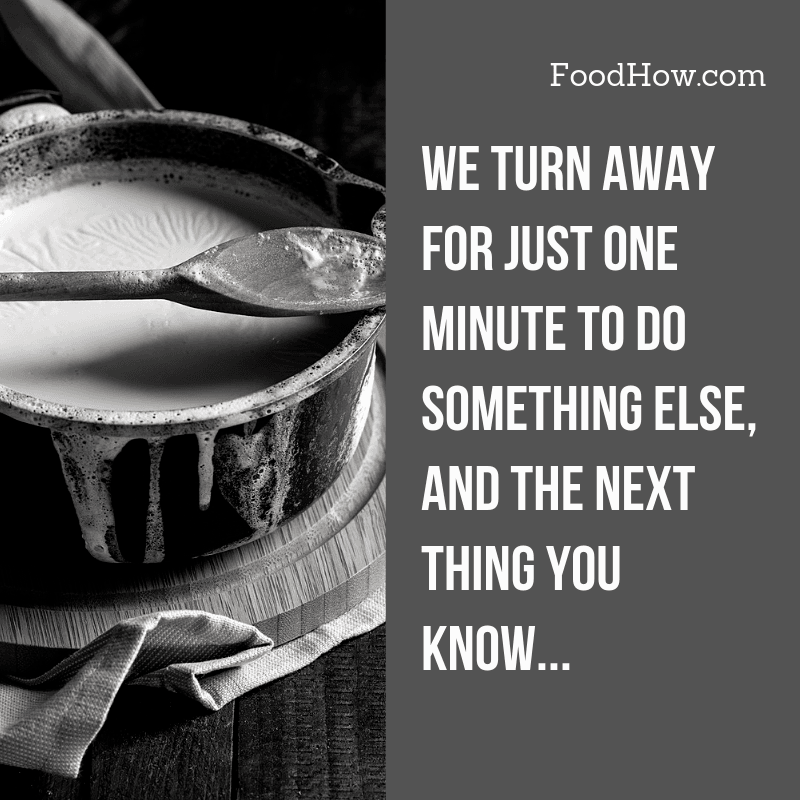 Catch the boiling point right on time – and your milk won’t stick! I have not used Boil Alert, Pot Watcher myself and I have heard mixed reviews about it. If you have used boil alert pot watcher then let us know about your experience with it in the comments below the post. As you probably know, the best way to melt chocolate without burning it is to use double boiler method. Now, double boilers can also be useful for boiling milk without burning or sticking and this I find to be one of the most effective options. You don’t even need to splurge on a commercially available one – all you need is a deep and wide pan, as well as a large glass/metal bowl that fits it neatly. The even heat distribution produced by the double boiled prevents uneven coagulation of milk proteins, ensuring perfect results. Finally, this may sound weird, but simply steaming your milk with an espresso machine offers perfect results! 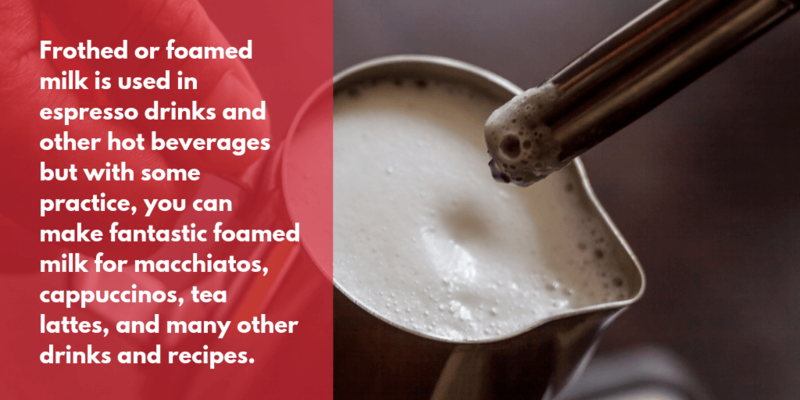 Depending on your needs, frothing the milk this way may produce the best results – but unfortunately, only works if you have an espresso machine handy. Espresso machine frothers work by introducing steam gradually to milk, and eventually the natural fats within the beverage expand, creating the signature silky micro-foam. Just delicious – and my kids love it! I have this simple Steam Espresso System With Milk Frother, it is very simple and cheap but it works great and makes great frothed milk. 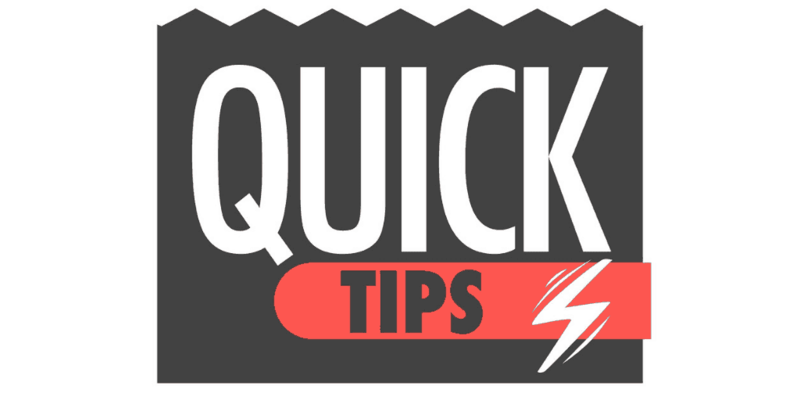 If you’re in a rush, heat your milk in the microwave by pouring it into an appropriate container and heating on 70% power, stirring every 15 seconds. Very soon, steam will start rising, which is when you know it’s ready. When using the double-boiler method, heat just until tiny bubbles start forming around the edge, and steam begins to rise. 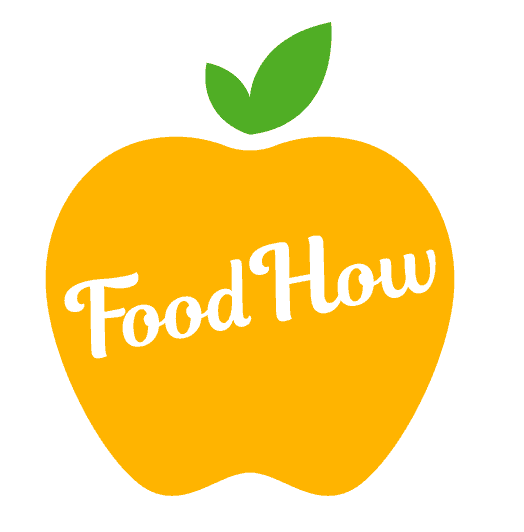 Raw milk requires boiling before consumption, pasteurized milk only needs to be boiled is it was stored at room temperature, and long-life milk is safe to drink right from the packet. Stainless steel heats up faster than cast iron, but you will need to pay closer attention to avoid running over and burning. Don’t forget to stir your milk occasionally when boiling – this helps to prevent coagulation. When the foam starts forming, break it up so it doesn’t trap the steam and cause overflowing. If safe to do so, leave the utensil in the pot during boiling to effortlessly break up the cream surface. Don’t overboil – anywhere over 2-3 minutes destroys beneficial nutrients in the milk. When microwaving milk, you can leave a wooden utensil in for easy stirring and to break the foam. Got a burnt layer of milk on the bottom of the pot, don't throw it away, there's a fix. 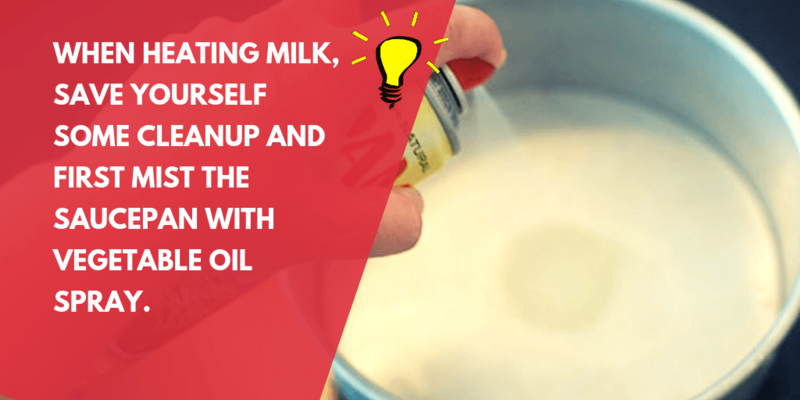 Put a bit of water and vinegar in the pot and bring it to boil, remove the pot from heat and add baking soda, let it fizz, #burnt milk lifts off. Wash the pot as usual. Hopefully, by now you feel like a true milk boiling expert! With a bit of practice and the right non-toxic cookware, you will see yourself getting perfect results in no time. In the meantime, please feel free to ask me any questions or share your tips or experience in the comments below, and happy boiling!